claims to whiten teeth will appeal to me. Just before Christmas I started to see the Beverly Hills Formula Perfect White Black Toothpaste appear on a number of blogs and I was instantly intrigued so decided to pick some up for myself. Beverly Hills Formula Perfect White Black Toothpaste claims to help improve the whiteness of teeth without any harsh bleach or chemicals. In case you're not aware the toothpaste itself is black.. yes you did read that correctly..black toothpaste. This is due to the toothpaste containing Activated Charcoal which helps to eliminate bad bacteria and remove stains from the teeth (therefore making them appear whiter). enough to leave your teeth feeling clean and your breath minty fresh. Now my teeth are already quite white, due to the sheer number of teeth whitening products I've used, but I can see a noticeable improvement in the brightness of my teeth since I have been using this product. 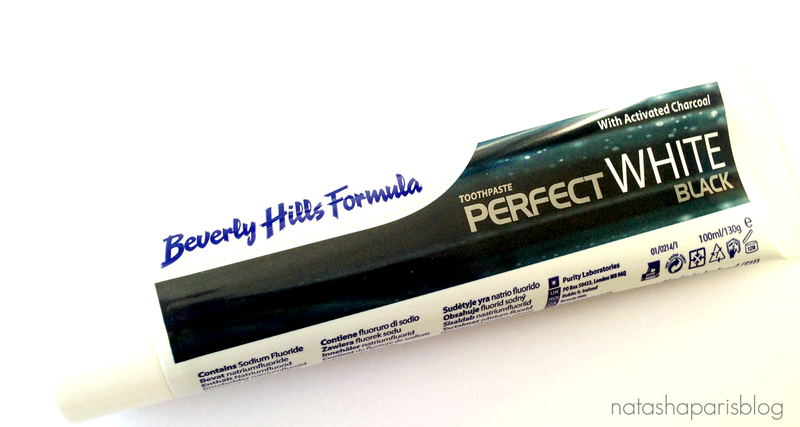 Beverly Hills Formula Perfect White Black Toothpaste retails for £4.99 and is available to purchase here (link). Have you tried this toothpaste? What did you think?